Animal Planet’s definitive atlas of animal life takes readers on a continent-by-continent and habitat-by-habitat passport to adventure! This is a beautiful, full-color over-sized book filled with pictures, maps, and loads of interesting facts on each page. The book is divided into eight chapter with one for each continent plus the oceans. Each chapter is further divided into habitats with discussion and photos of the animals that make the region their home. Aside from a short introductory paragraph in each sub-chapter, most of the text for the descriptions of each animal are placed in brightly colored information boxes with a same colored line connecting them to a photo of the animal. The writing is entertaining and easy to understand. 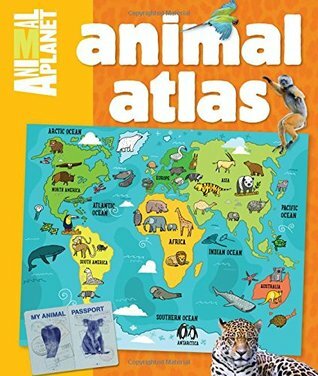 Even children too young to read will enjoy having this read to them as they look at the photos and drawings and find the animals on the map. Very creative and sure to delight both children and adults. Source: Review copy provided by the publisher through AmazonVine. This looks like a fun animal book for children! I’ve got this but haven’t gotten to it yet. I’m not surprised to see it’s so good.